Set against the turbulent backdrop of the Hundred Years' War, I Serve chronicles the story of Sir John Potenhale. A young Englishman of lowly birth, Potenhale wins his way to knighthood on the fields of France. He enters the service of Edward, the Black Prince of Wales, and immerses himself in a stormy world of war, politics, and romantic intrigue. While campaigning in France, Potenhale develops an interest in Margery, a spirited lady-in-waiting with a close-kept secret. He soon learns that Sir Thomas Holland, a crass and calculating baron, holds the key to unlock Margery's mystery and possesses the power to overturn all of his hopes. When the Black Death strikes Europe, however, Potenhale realizes that the fiercest enemy does not always appear in human form. Seeing the pestilence as a punishment for the sins of his generation, he questions his calling as a knight and considers entering the cloister. Margery or the monastery? Torn between losing his soul and losing the love of his life, he finds friendship with a French knight who might - just possibly - help him save both. I went into this book expecting to learn about the Hundred Years War and to be entertained. This story managed to do one of these things. John Potenhale is telling a very lengthy tale to the widow of a French knight who he met and admired. The entire book is told in a kind of flowery language that makes me think of the great King Arthur stories or Chaucer’s tales. Such manner of telling a tale works good for a Shakespearean play but was rather tiring for a 10+ hour long novel. I did like that setting was well done. The politics of the day as well as the geography were covered but not in a big hard to swallow lump. I felt like I was learning things as Potenhale was as he worked hard to become a knight and gain esteem. I think this is a good introduction to the Hundred Years War if someone is looking for a way to get interested in that time period and location. There are very few female characters and this was a disappointment. There are plenty of histories (nonfiction and fiction) for this war that fail to include the ladies so I was hoping this tale would be more inclusive. There’s Margery, a handmaid to the Lady Joan. That might be it… I think Potenhale thinks about his mom from time to time…. and the Virgin is mentioned several times when a knight feels like praying. Joan and Margery are love interests and nothing else. So that let me down. The tale has a few slumps but then a rousing battle scene at the end. It wasn’t all glory, which I was glad to see. Potenhale takes in the reek and savagery of battle. Then there’s a bit of an epilogue in which we learn the outcome of the romantic pining that has been going on. All told, it wasn’t great but it wasn’t bad. 3.5/5 stars. The Narration: James Young did a good job with this narration. He maintained a flowery oration all the way through as the story required. His French accent and pronunciations were great. His female voices could have used a touch more femininity. His pacing was just a touch slow for my taste. 4/5 stars. I received this audiobook as part of my participation in a blog tour with Audiobookworm Promotions. The tour is being sponsored by Rosanne E. Lortz. The gifting of this audiobook did not affect my opinion of it. I liked it and I liked it a lot! I mean… the descriptions, the characters, the history are all there! These elements, together with a great narration, make this audiobook a success. There are many themes mixed in here, but the one that stands out is by far life during the Hundred Years’ War between England and France and all the historical aspects of the time. I am not complaining, I like history! We have as hero and voice of the story John Potenhale, a man that becomes a knight after his heroic acts on the field. But soon his beliefs and his confidence will shift towards a higher purpose. Realizing that God may not approve of his actions, he thinks about joining the monastery. But are all decisions in life easy? Nope, especially if women are involved (sorry, but let’s admit the truth). This is not a book focused on Christianity, but on history and on the beliefs of the people living those times. The author has managed beautifully to present the war, Black Death and the reign of the Black Prince of Wales, through the eyes of a good man, wanting to make a difference. The shift in his desires, his indecisions, are well captured as well. Maybe because I am a fan of romance, I would have wished that this angle could have been better explored, especially in its mix with politics Throughout the book, I had the impression that this big amount of things were squeezed between the pages and many of them not fully developed. Also, I wanted to see more of the Black Prince and how his rule affected the people. The narration was great. James Young used the perfect pace for my taste and as well his voice acting was done in a beautiful way. My only wish would have been to hear more of the accents here and there. Other than that, nothing to complain about. 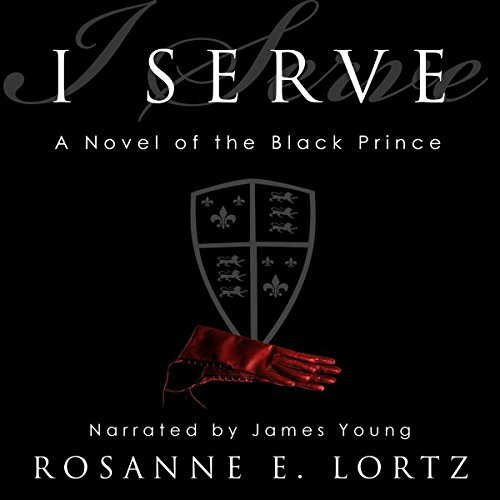 With all these items out in the open, I’m ending my review mentioning one more time that “I Serve” by Rosanne E. Lortz is a beautiful audiobook, with great historical details and many themes mixed. I liked and I would recommend it! Lortz has a very interesting story here! I liked the fact that this novel had a lot of good facts mixed in with the fiction. It was pretty suspenseful and fun to listen to. I'd recommend getting the audio as I absolutely loved it! As with historical fictions and me, it did take me a little bit to get into the story but once hooked, I had a blast listening! I give it a 4.5/5 stars. Young did a good job with narration. I think he created unique voices for each character and I liked the emotion he put into the emotional scenes. He has a good regular narration voice as well. The studio production doesn't have any issues either. So I give the audio a 5/5 stars!